Journalists based in South Kazakhstan kindly provided Fergana with photographs from the scene of events; said journalists are unable to publish these images in their own mass media. In the evening of February 5, disturbances took place in the village of Bostandyk in Saryagash District of South Kazakhstan Region. 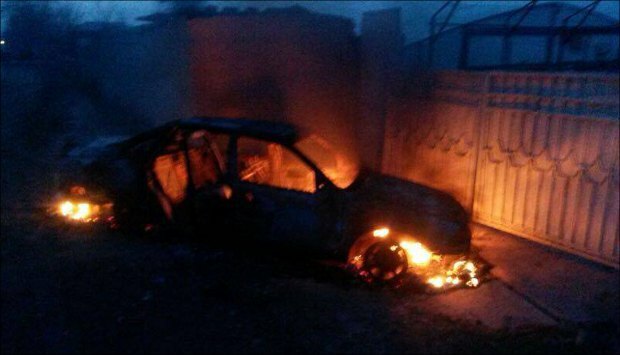 Over a dozen of vehicles were destroyed, while several houses were looted and burned during the disorder. Fortunately, as the saying goes, no victims or casualties are were reported. The news about the events broke only the next morning. 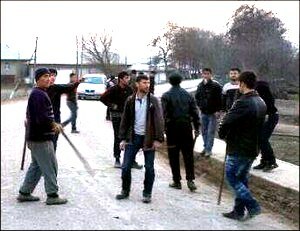 The rumour has it an aggressive crowd of several tens of people that organized the pogrom was eyeing the property belonging to third-generation ethnic Tajiks living in the villages of Bostandyk and Yntymak. However, a brief press release circulated by the Internal Affairs Department (IAD) mentioned nothing about the ethnicity of those who wreaked havoc. Ethnic Tajiks started living in South Kazakhstan since 1930s. Official data suggest over 60,000 ethnic Tajiks live in Kazakhstan today. At least 5,000 or 7,000 live in ethnically diverse adjacent villages of Bostandyk and Yntymak. Kazakhs, Russians, Uzbeks, Tatars, Korean and Turks live here as well. “Ninety percent of Bostandyk residents are ethnic Tajiks, while more than half of Yntymak’s population [is Tajik],” a local resident, Artur [name is changed], told us. Saryagash District is almost the warmest part of Kazakhstan that gets the biggest number of sunny days. Tajiks were forcefully relocated here by the Soviet authorities and settled in swampy and undeveloped areas. They have worked hard for several decades to turn these areas into blooming fruit and vegetable gardens. According to local police’s preliminary investigation findings, the murder in question, which triggered the disorder, took place in the night of February 4. The breathless body of Bakhytjan Artykov, 30, was found with stabbing wounds outside the village of Bostandyk. 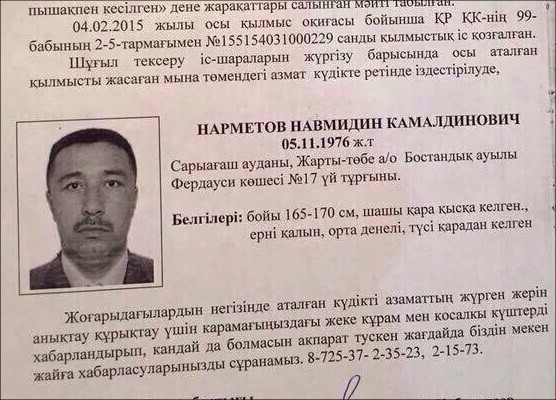 “It has become known immediately that Naumiddin Narmetov, a local resident of Tajik ethnicity, born in 1976, is suspected in committing this crime. People knew that they had some problems. But nobody paid attention; no one even knew who actually was wrong [in the quarrel],” the village residents say. “The murdered was buried on the fourth [of February]. There was nothing extraordinary during the funeral. Locals bury their dead in silence and organize no loud rallies. Nobody even suspected pogroms would unleash the very next day,” Artur continues. 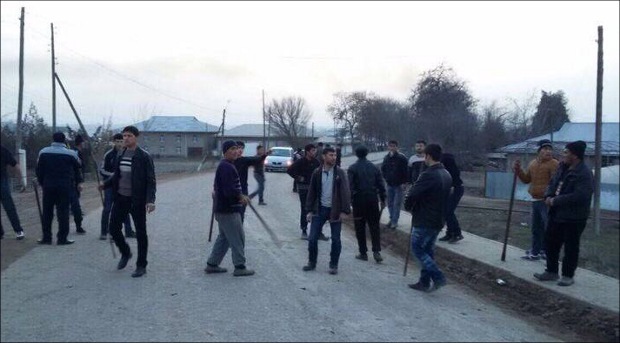 Police first said “misunderstanding” happened between Tajiks and Kazakhs in Bostandyk. Saryagash District Governor Bukarbay Parmanov told Azattyk reported over the phone that no disorder has actually taken place. So, what happened in the evening on February 5? The Kazakh authorities have been applying efforts necessary to hinder the dissemination of independent information since the events started unfolding in Bostandyk. As soon as the website of Azattyk Radio posted news on disorders in Saryagash District, it was immediately blocked. Kazakh online publications and agencies told Fergana that prosecutors and information ministry employees are calling website editorial offices and forcing them to remove and delete videos and photos; they are told to use only the interior ministry’s information or face permanent blocking of their websites. The question of why do the Kazakh authorities try to block issues of pogroms against ethnic minorities remains unanswered. Perhaps the officials do not want to upset the president. After all, he is claimed to have secured one of the most important achievements of modern Kazakhstan—the “interethnic harmony” that is talked about so much. The situation in the villages of Yntymak and Bostandyk in Saryagash District stabilized as of Sunday, February 8, 2015. No violations of law were reported, while law enforcement agencies are investigating into the facts of pogroms, arsons and looting. Fergana contacted several residents of Bostandyk, who wished to remain anonymous. Here is what they told us.